Find The Source Of Your Leaky Chimney! Your fireplace is the last place you should be seeing water! If you have noticed water in your chimney, firebox or on the surrounding walls or ceiling, you are probably suffering from a leaky chimney. While chimneys are built to stand strong against the elements, time and other factors can lead to damage and leaks.  If you are experiencing a leaky chimney, it is important that you have it inspected as soon as possible to uncover and repair the source of the leak. Repairing the damage caused by a leaky chimney without repairing the source of the leak is a recipe for disaster; water will continue to enter into and damage your chimney and home until the source of the leak is identified and repaired. The flashing is the metal seal that covers the area where the chimney meets the rest of your roofline. If damaged or improperly installed, the flashing can allow water to leak through, damaging the chimney as well as the surrounding walls and ceilings. The chimney cap protects the top of the flue from animal, debris and moisture intrusion. If absent or damaged, nothing is there to keep water out of the flue. Damage caused by a faulty chimney cap often appears as water in the flue or firebox. The chimney crown is the masonry that surrounds the flue at the top of the chimney. Because of their position (directly exposed to the elements), chimney crowns can easily become damaged or cracked and allow water into your system. Finding the source of a chimney leak can be a difficult process. 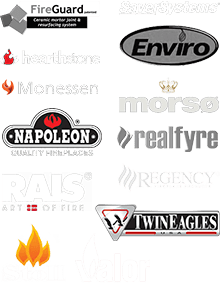 At Olde Towne Chimney & Fireplace Sales, our expert staff is highly trained and experienced at identifying the causes of chimney leaks. Once the cause of the leak has been identified, we can repair it and work to prevent the leak from coming back. Don’t Live With Leaks – Have Your Chimney Inspected Today! If you have a leaky chimney, contact Olde Towne Chimney today. Our highly trained technicians can identify the source of your leaky chimney, repair it and help you get back to enjoying your fireplace as soon as possible! For more information or scheduling, please call us at 812-284-0123 or click here. Eventually, even the best of masonry chimneys may need repair. That’s when you call the chimney and fireplace repair pros here at Olde Towne!